As you know, I've been on holiday for a couple of weeks, so already I'm behind of my project of trying out 52 new recipes (i.e. 1 new recipe per week). But, instead of stressing about it and trying to catch up by cramming in 2 or more new recipes in a single week, I'm just going to take my time and change my post titles from week #1, #2, #3 etc and call them recipe #1, #2 or #3 ... that way, as long as I'm at recipe #52 at some point during 2012, I'll consider my little project a success! Aren't they the cutest? As soon as I saw them, I knew I wanted to try baking these sweet little morsels for friends and family as a Valentine's Day treat. 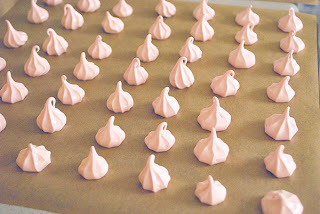 I know I'm technically too early for Valentine's Day but hey, it's only 2 days away and I'd read somewhere that meringues could last up to 2 weeks(!) if stored in an airtight container, so I've really got nothing to loose. gorgeous bottle design isn't it? Apart from the measurements and substitution of the liqueur for the extract, I followed the rest of the recipe as stated on Darla's website. I've NEVER made meringues before! I knew there was LOTS of whisking involved, I knew the oven temperature needed to be LOW and I knew they took AGES to bake. What I didn't know, was just how sticky and messy they were! Seriously, I couldn't even take any photos whilst I baked because my camera would've been one big pink mess if I'd tried! So you'll just have to take my word for it that I did bake these little goodies, from scratch and the results weren't too shabby. Sorry the picture isn't very good. My kitchen gets wonderful sunlight during the morning, but by midday, it's dreadful! Today's been particularly dull and overcast and when I tried using the flash on my camera, the picture was even worse! Still, you get the idea, right? The pre-baked meringue mixture really was a beautiful baby pink colour. Unfortunately, it did dull a little during baking. So if you're going to try this recipe yourself, I'd say add more colouring. Add it so it's a vivid, almost shocking pink. It will fade! Also, I did bake 1 batch of white meringues, but despite my oven being at it's lowest possible temperature, they did change colour slightly. Instead of being bright white in colour, they were more of a very milky latte colouring. They still tasted pretty good though. Oh, and on the subject of taste, the raspberry liqueur flavour really didn't come through at all. I guess if I'm going to try baking these again in the future, I'm going to have to find somewhere that sells raspberry extract.